Floodplains and wetlands in freshwater and estuarine areas provide essential nursery habitat for a large number of fish and invertebrate species, many of which are commercially and recreationally significant. Land and water management can and frequently have resulted in the exposure or drainage of acid sulfate soils. The artificial draining of floodplains and wetlands on the coast or drying of usually inundated wetlands inland results in permanently saturated soils becoming exposed to the atmosphere. When this occurs, this exposure causes a number of chemical reactions, resulting in a build-up of sulfuric acid, iron and aluminium. With the first rains or with re-wetting these chemicals wash into the waterways. Sulfuric acid affects waterways and the aquatic life in them. Most aquatic life needs a minimum pH of 6 to survive. The pH of acid water can be as low as 2, and is often around 4. The lower the pH, the stronger the acid in the water. Fish and crustaceans try to avoid acid water, but if they cannot escape, they may die. Plants, unable to escape the acidified water, are often killed. Drought-breaking rains can result in massive fish kills. This is because in a drought the watertable has dropped and the iron sulfide layer has oxidised. Heavy and prolonged rain can wash substantial quantities of sulfuric acid and aluminium into waterways, and result in a fish kill event. 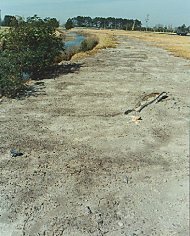 Fish kills are the most obvious effect of acid sulfate soils; the chronic, less visible effects such as reduced hatching and decline in growth rates are more common and widespread. Repeated flows of acid water prevent the fish population recovering. Acid water also affects the health of fish and other aquatic life through damage to the skin and gills. Skin damage increases the susceptibility of fish to fungal infections which may lead to diseases such as epizootic ulcerative syndrome, also known as 'red spot disease'. Gill and skin damage reduce the ability of fish to take in oxygen or regulate their intake of salts and water. ’Red spot’ disease causes significant economic losses to commercial fishermen. Commercially important species, such as oysters, can also be affected by acid sulfate soil outflows. Acid water affects the habitat of aquatic life. When acid water mixes with less acid stream water (above pH 4) the iron dissolved in the acid water precipitates and smothers plants and the streambed. These iron solids can move downstream and smother streambeds where there is no acid water. The aluminium in acid water is toxic to most water organisms because it damages their gills and at lethal levels can suffocate them. Cloudy green-blue water is an indicator of the presence of aluminium. Sulfuric acid can also dissolve heavy metals in the soil such as cadmium. When these are washed into waterways after rain they can be absorbed by fish and other aquatic life. Only a few acid-tolerant waterplants can survive in acid water: these include waterlilies and spike rushes. The acid-tolerant waterlilies can take over the drain or stream, even when pH returns to normal, preventing other species from re-establishing. High levels of aluminium in acid water can cause particles floating in the water to clump together and drop to the bottom, leaving the water crystal clear. This clarity looks attractive but indicates that the water is too acid for aquatic life. The clear water can be up to 50C warmer than water with particles floating in it. The clear water allows acid-tolerant plants to saturate the water with oxygen which can kill fish through the ’bends’ or gas bubble disease. Clear water also increases the risk of fish suffering sunburn and melanomas. Listed below are the short term and long term effects of acid water on fish and fish habitat. Anna Bay Acid Sulfate Soil Assessments: This report provides results of detailed on-ground assessments of the distribution and impacts of acid sulfate soils in the Anna Bay sub-catchment, which discharges into the Port Stephens – Great Lakes Marine Park.